It is a tradition at IAC’s congresses to tour major ceramic points of interest surrounding the country of the Assembly. In keeping with this tradition, we have organized both pre and post-congress routes intended to enrich your experience and appreciation for Spanish ceramic culture and history. These tours are outside of the basic program of the Congress and are paid for separately from congress fees by each participant. All transport, meals and accommodation are included in the fee of each tour (to be determined). Visit to some of the exhibitions prepared on the occasion of the Congress, visit to the city and architectural monuments of Mudéjar art and contemporary ceramics of ceramists from Aragón. Visit to this city, which is home to some of the finest examples of ceramics in architecture in Mudéjar art. Overnight stay in the city. Visit to the González Martí National Museum of Ceramics and the contemporary ceramics exhibit in the same centre. 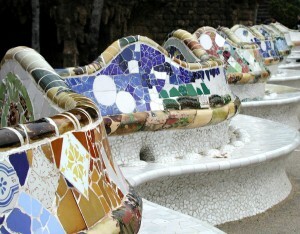 Visit to the old section of the city and buildings with examples of Modernist ceramics. It is one of the most important ceramic centres of Spain, close to Valencia, with a tradition from 14th Century until today.